Camera sliders and "Dana Dollies" are very popular right now. They offer the ability to add camera motion and low cost production value to your shots without needing a lot of room or time for set-up. 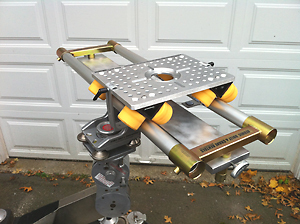 Packages consist of a camera mounting plate with wheels, pipe sets of various sizes, and jr. stand mounting brackets. Slider Dollies are perfect for confined spaces like office cubicles, beaches, rocky terrain, or just about anywhere you can't get conventional track dolly easily. Slider Dolly track can be laid right on the ground, or mounted between two jr. stands to provide flexibility with your camera height. We redesigned the "Dana Dolly" to make it safe, and more useful. Our slider dolly is more stable, and incorporates custom safety bars that not only keep the dolly and camera from tipping over, but adds the ability to add tension as you push the sled. We offer Slider Dollies in many different sizes. The most common package are 3', 4', 5', 6' & 8' pipe lengths, although we can provide any size you need. The Slider Dollies can also be run on any standard dolly track. In addition, we have a 3' and 4' and 5'' version of the Slider Dolly that can be mounted right on a conventional dolly like a Pee Wee or a Fisher. This gives you the feel of a more conventional slider and the ability to reposition the Slider Dolly quickly.